Manufacturer of a wide range of products which include gas flare system and bio gas flares. 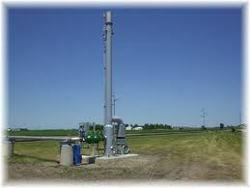 We manufacture, supply and trade excellent quality Gas Flare System. These systems are manufactured keeping in mind the diverse requirements of customers. The experienced engineers employed by us make use of high-grade material in the manufacturing process so that our range in in adherence with international quality standards. We are counted among the prominent manufacturers, suppliers and traders of an extensive array of Biogas Flares. Manufactured using high quality material, our range is in tandem with international quality standards. To cater to the diverse requirements of our esteemed customers, we accordingly customize these flares.